Unhealthy hair often has a louder voice than we’d like it to. There are countless fancy, expensive chemical treatments out on the market, but keeping your locks in tip-top shape doesn’t have to break the bank. 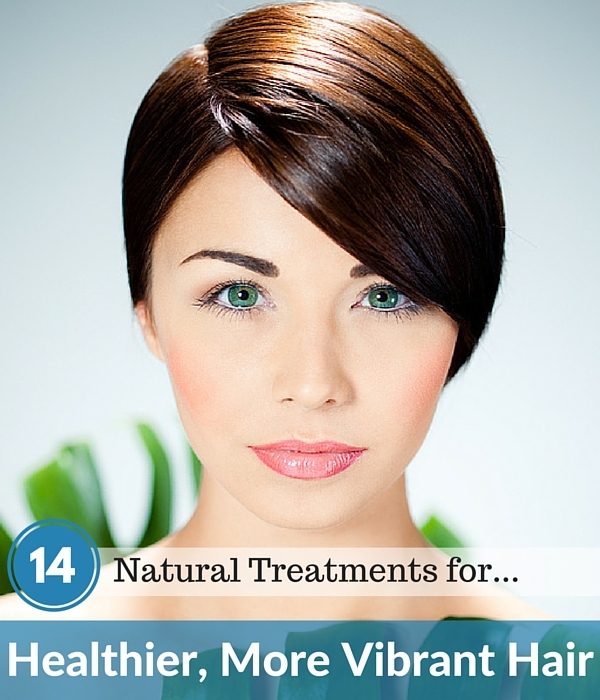 Sometimes the best treatments for what ails your hair are as near as your kitchen cabinet! Natural ingredients help gently rejuvenate dry or frizzy hair without adding a mess of unpronounceable chemicals to the worry list. Do your hair a favor and schedule an all-natural spa day in the comfort of your own home. Knowing these natural products are safe and easy on your scalp and skin is an added bonus when helping your hair recover its natural and healthy beauty. Wouldn’t it be great if your hair could look this good? This long-time kitchen staple has found its way into the hair care routines of many people over the past few years. Washing hair with baking soda has been dubbed the “no-poo” method but has also found use with conventional shampoo use in the past. Some recipes call for adding a tablespoon in with your regular shampoo and scrubbing, but you don’t really need to add the shampoo. Just mix the baking soda with warm water, pour onto your hair in the shower and gently scrub your scalp. This will help break up product and oily build-up, freeing your hair from the excess weight. Apple cider vinegar makes up the other half of the no-poo method natural hair care routine. Combine a tablespoon of ACV with warm water to create a rinse that completes what washing with baking soda started. The vinegar will rinse away any residual build up as well as close the hair’s cuticle. This is what makes hair shiny when light bounces off a closed cuticle. Before rinsing out the vinegar and water mixture give your tresses a nice combing- ACV is also a good detangler. Don’t worry about the smell; once you rinse the vinegar out, the smell goes with it. This versatile ingredient has become the darling child of the natural beauty world. Coconut oil will help soften dry hair and bring listless highlights back to life. For a quick fix, rub a small bit between your hands (if it’s still solid- it’ll melt quite quickly) and apply to ends. If you’ve got some more time in your hands feel free to give your hair a deep conditioning with a coconut oil mask. Apply to hair 20-30 minutes before washing and wrap your hair with an old towel or shower cap. Shower, wash and embrace vibrant hair again. Dandruff and dry scalp can be a huge bad hair day maker. Enlist the help of tea tree oil. Prior to washing take a few drops of tea tree oil and massage into your scalp. If you’re washing with baking soda you can just add the oil to your mix. Tea tree oil helps bring hair back to life by treating scalp irritation and itchiness and adding a bright shine to locks. It’s also great for regulating the production of oil from the scalp reducing oil hair and prompting hair growth. A nice cup of tea is a quick way to take a moment of stress relief. The benefits of green tea have been praised for years and now there is evidence that it can help with hair loss. Studies have shown that there are proven benefits to drinking green tea and hair loss but it is not a proven treatment. But there is certainly no harm in drinking it or taking a green tea supplement. You can also make a green tea rinse for your hair a few times a week to help with dandruff and scalp issues. The humble avocado is a powerhouse of nutrition and health benefits and it can also used as a way to deep condition hair. Several hair products have included avocado in some form on the ingredients list yet you don’t have to go that far. Avocado’s creamy texture makes it perfect to blend into a rejuvenating hair mask. Loaded with protein, potassium, vitamins and amino acids, avocados are a one-stop destination for making your hair shine again. Like green tea, it can stimulate hair growth, moisturize your locks and sooth a dry scalp during the winter months. The skin benefits of aloe has been known for generations. But it also has benefits for a healthy head of hair as well. The same benefits it has on your skin can also be applied to your scalp. Aloe Vera has been used as a hair gel but the best way to harvest the benefits of this plant is to use it straight from the plant and combine with other natural ingredients. You can make it into a variety of hair treatment options such as adding it to your shampoo, part of a conditioner or as part of an overnight hair treatment. The scent of lavender is an instant stress relief. Using the oil as part of your hair care routine will help your tresses and give your body and mind a much-needed relaxing bonus. Mix lavender essential oil with jojoba oil to create a stimulating massage oil for your scalp. This will help with stimulating your scalp and promote healthy skin and hair growth. For those blessed with luscious curls you can also make a curl reviving spray with distilled water and lavender oil. Just spray on your hair when you need a boost. This keeps your curls bouncy and moisturized throughout the day. Although the avocado surpasses the banana in the potassium count that doesn’t disqualify it from being a great natural hair care solution. Besides potassium bananas contain a host of other hair nourishing vitamins, such as biotin, vitamin C and vitamin B6. Eating bananas will provide these vitamins and minerals. If you happen to have some overripe bananas on hand you can choose to make a deep conditioning banana hair mask. There are several versions of this recipe available, some ranging from just pureed bananas to including honey or coconut oil. The cooling effects of peppermint also have several benefits for the hair and scalp. Used similarly to lavender oil, peppermint oil can moisturize dry hair, help balance oily hair, combat dandruff and dryness and promote hair growth without toxic side effects. Several shampoos and conditioners on the market contain peppermint extract. Make a scalp massage oil with jojoba and peppermint oil and use as you would lavender oil. This will promote hair growth and prevent hair loss by stimulating hair roots. You can also make a peppermint rinse with fresh mint leaves and water. Eggs pack a lot of protein, fats and vitamins and are great for hair conditioning. They’ve been used in skin care products for tightening skin. Egg whites are good for reducing bacteria that could irritate the scalp and balancing oiliness, while yolks are good for providing a high dose of protein. There are several different recipes that you can use with eggs and other natural ingredients for hair masks and deep conditioners. One word of caution though; always rinse egg from your hair with cool water or you risk cooking it into your hair. Otherwise known as “liquid gold,” argan oil has become a common ingredient in several hair care products and conditioners. It comes from Morocco where it has has been used to treat skin conditions as well as fortify hair. It can be found on its own and used as a hair serum to combat frizzy hair and as a conditioner. High amounts of vitamin E present in argan oil make it an ideal natural hair treatment. Argan oil can also be used as a shampoo or overnight conditioning agent. What makes argan oil a must-have part of natural hair care is its ability to coat hair and make it less vulnerable to damages caused by brushing or handling. Castor oil may not seem like an ideal hair treatment especially to those whose parents probably gave it to them as a child. But it has some impressive skin and hair care merits to back it up. Loaded with vitamin E, protein, and Omega 6 and 9 fatty acids castor oil is great to use as a skin oil cleanser or to help revive listless locks. It is also antibacterial and anti-fungal which makes it great for the scalp. Among its benefits is increased hair growth and thickness. Use castor oil as a hair mask mixed with coconut oil. Wrap with a warm towel, let sit for half an hour and then wash out with your normal shampoo and conditioner. The Mediterranean signature oil has also found its way into numerous hair care products. But slathering olive oil at first sounds counter intuitive. However it has been used as a skin and hair product throughout history so don’t count it out just yet. Cooking with olive oil does impart some of its benefits but applying it to hair and scalp can do a bit more. Good for moisturizing the hair and scalp, you can use olive oil on its own to give yourself a scalp massage. One of the extolled benefits of using olive oil for hair care is that it promotes hair growth and stops hair loss by blocking DHT hormone production.